Microsoft Excel – This is second most used application if not the first.It is powerful yet simple.You can create simple spreadsheets,maintain your account balance details and other similar tasks. Microsoft Powerpoint – Creating presentation is common task in business world as well as students.This package provide the functionality. Microsoft Outlook – This is single place to view your outlook.com or hotmail emails.This application is not used much. Microsoft Access -This application is more for a technical person.Non technical people do not use it much.It is Database application. Microsoft Publisher – It is photo management application.Using it you can arrange your pictures and share them online or email them to your friends. Microsoft Office package is costly application.Earlier in my non professional days I was not eager to pay the amount.But as mentioned above regular day to day online work will need either one of the applications offered by Microsoft Office.This made me search for alternatives of Microsoft Office. There are quite few alternatives available but not all of them are completely free.I used most of them.Some lacked the functionality and some lack the power.After trying few office suites I came across two packages which seemed powerful and easy to use.Some of the features offered by these packages are better than their Microsoft office counterparts.I would be listing the alternatives along with their comparison with Microsoft Office. The alternatives are mentioned in order of my preference for them.You can use any of the alternative.I have not ordered them based on their ranking.The first one is my personal favorite due to one feature it provides out of box (without need to install any extension).The second is most used Office package by me. LibreOffice is backed by The Document Foundation.It is completely free of cost.You can download it or use it without paying a single dime.You can download it from this link.LibreOffice is available for all major operating system like Windows,Linux and MacOS.It is also available as Portable App. This is the first choice of mine.It is based on Open Office.Open Office is later on.There is not much to choice among LibreOffice and OpenOffice.But one feature of LibreOffice makes me choose it above OpenOffice.You can create PDF files from your Word documents and sign it using watermark images or texts.OpenOffice does have PDF creation functionality but does not have signing it with watermark functionality. As you can see from above table no Microsoft alternative exists for OpenOffice Math or LibreOffice Math.Also LibreOffice Charts is one application missing in both OpenOffice and Microsoft Office. 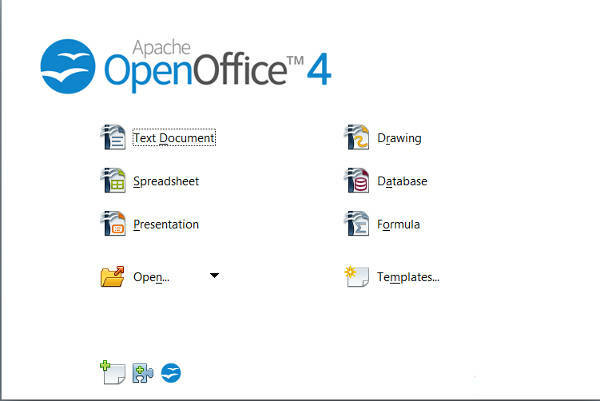 OpenOffice is OpenSource software backed by Apache.It is continuously developed Office package and with time is becoming more powerful.It is also the core on top of which LibreOffice is created on.LibreOffice adds few more features in it.As you can see Charts application offered by LibreOffice is not present in OpenOffice. Open Office is available for all major operating system including Windows,Linux and MacOS.It is also available as Portable App.Apart from these platforms it is also available for Solaris,OpenSolaris,FreeBSD and OS/2.OpenOffice is also ported to Mobile Operating system Android. What makes OpenOffice and LibreOffice powerful? The most important features which makes OpenOffice and LibreOffice powerful than Microsoft Office is Extensions and Templates. All these extensions can also be applied to LibreOffice as well.The best part is that the number of extension are increasing with time. These templates are available with OpenOffice but can be used with LibreOffice as well.The Extensions and Template count mentioned above does not include those offered by LibreOffice.So including those will increase the count.Also the number will be increasing with time. OpenOffice is offered in 39 languages including Hindi and Tamil Indian languages.Almost all major languages in World are covered by it and support for more languages are added with time.You can install it with support to more than one language.For example you want English,Chinese and Hindi installed in a single OpenOffice installation.It is possible and you can switch between the languages as per your suitability. It also offers dictionary and spell check extensions for some of the major language apart from English.So your document can be proof read and checked for Grammatical as well as spelling mistake. OpenOffice has lots of documentation available for you to explore and know in and out of the package.All the information is free of cost.There are support forums,mailing list and online documentation.It is simple and easy to use.But in case you have trouble doing anything using OpenOffice or want to know more about options then these are the place to explore. A simple Google search about your problem will give you good amount of results.There are many volunteers helping new users get familiar with the tool.So you will not find any problem getting help. The above table is based on my experience with these two Office packages.I might be biased towards OpenOffice.So I would like to hear from you about both of them.You can also share your experience with OpenOffice or Microsoft Office and the reason you are in love with your Office package. Previous Previous post: How to protect your Internet browsing history from others? How to keep one default format for Date (fixed)?